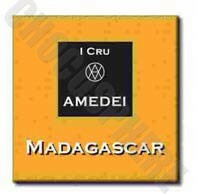 Amedei Madagascar Napolitains Bag. 70% cocoa. Origin: Madagascar, This chocolate comes from Madagascar to bewitch you with the magic of its dark beans and their full, acidic, subtly minty flavor. It will take you into a soft embrace that will leave behind the memory of complex aromas perfctly balanced between fruity and tasted nuances.5g net wt.